It would be a rare trip, indeed, to the northwoods that a visitor not see a white-tailed deer. They are nonetheless very pretty and fun to look at. Dawn and dusk are the best times to view these animals as they graze in a clearing. They can also often been seen browsing the green vegetation lakeside during a boat ride on Fox Lake. Visit this website to learn more. The grey wolf is a magnificent creature who does its best to stay away from people. On a cool night, you may hear one singing to the moon, or you may hear wolves gabbling to each other in a small pack. Visit this website to learn more. One of the most notable animals is the loon. The common loon makes an eerie call, which can often be heard at night, and a loud yodel, which may be heard at about any time of day. You will always be reminded of your stay here whenever you hear a loon. 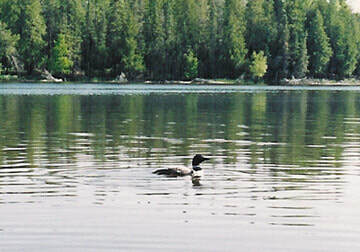 Click here to be treated to a loon song. Fox Lake Resort is found in George Washington State Forest, and just outside of Chippewa National Forest. 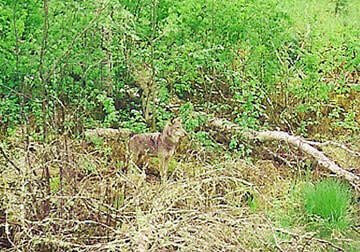 Our woods are therefore highly protected and contain countless other types of wildlife. A lucky visitor will be thrilled to view a bald eagle sitting high atop a tall pine tree or patiently gliding and fishing over Fox Lake. Or a moose may wade out and feed on the water plants along the shoreline. Otters, wolves, foxes, ospreys and many other critters can also be seen by wildlife watchers. At least four varieties of wild orchid appear in the area surrounding Fox Lake. 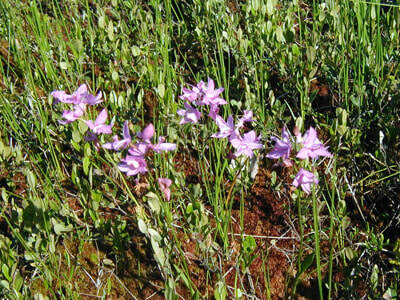 One of the prettiest and most delicate is the Grass Pink species, pictured below. Others include three Lady's Slipper varieties the Small Round-Leaved Orchid, the Fairy Slipper, and the Small Purple Fringed-Orchid. For the adventurous plant observer, two species of carnivorous plants can be found in a bog near our resort. 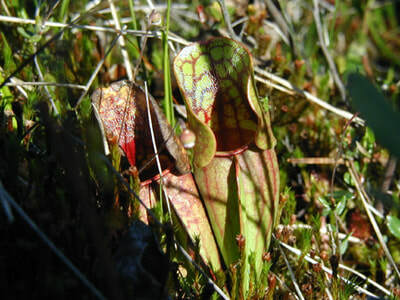 Pictured here is the carnivorous pitcher plant. That grasshopper might be lunch soon!